(MOVED FROM 6/11) Best. Ribs. Ever. NOTE: This class was moved from Tue 6/11. 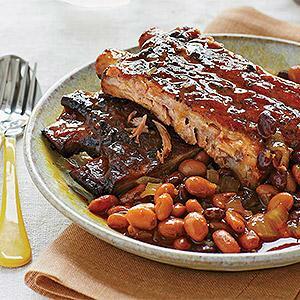 Yeah, yeah, we know – your ribs are the best, right? Even YOU might argue with yourself on that one after you take this class. Folks, it doesn’t get much better than having Bruce Campbell, an award-winning BBQ expert, in the house teaching us everything he knows about RIBS – from ‘old-school’ to ‘high-tech’ techniques, Bruce will cover it all. It’s a rib-ticklin’ class (we had to go there, didn’t we?) where he’ll explore the different cuts and types of ribs (Spare ribs, St. Louis Ribs, Baby Back Ribs, etc.) and offer spot-on advice on how to determine which package to buy at the store. How do you prepare all these ribs? Yup, he’ll show you, including use of rubs and mops, super handy BBQ techniques, and a lesson on the proper equipment to get the job done. He’ll demo three different methods of cooking ribs – smoking, baking and the newest fad, sous vide (once you know this cool way of cooking ribs, you may never look back!). Plus, you’ll get to taste ‘em all – along with some fantastic recipes for sides like Cheesy Corn (you perked right up when we said cheese, didn’t you?) and Bruce’s Award-Winning BBQ Beans. Whoa. This informative class will take your rib-cooking expertise to the next level … and we ain’t just blowin’ smoke! Expect to take lots of notes in this demo-only class. Midwest Barbeque Institute™ is a trademark and service mark of The Culinary Center of Kansas City®.